Gov. 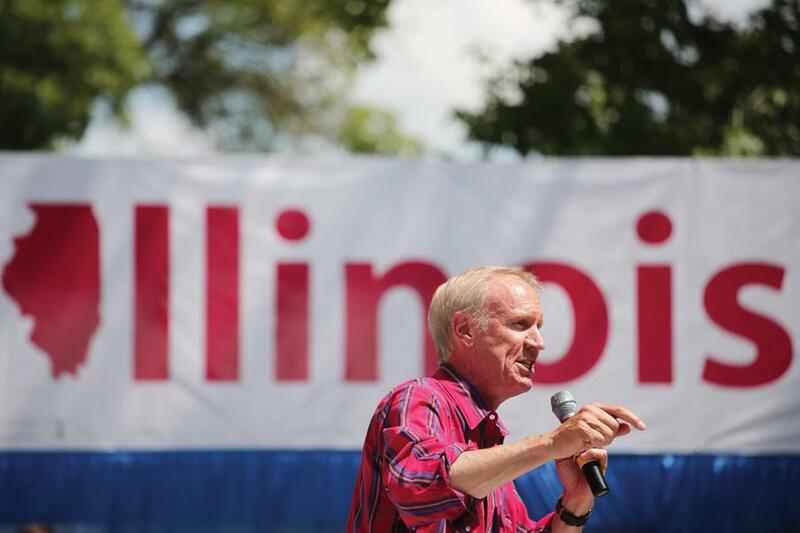 Bruce Rauner speaks at the Illinois State Fair in Springfield in August. Rauner urged lawmakers in his “State of the State” address to cooperate in order to reach a “truly” balanced budget. Although the Illinois Senate didn’t bring their “grand bargain” package of budget bills to a vote this week, Senate President John Cullerton (D-Chicago) said they can expect to vote after returning to Springfield on Feb. 7. The package of 13 bills includes measures to raise the income tax, freeze property taxes, reform pensions and add multiple new gambling sites. It was negotiated by Cullerton and Senate minority leader Christine Radogno (R-Lemont). The pair created the package to put in place a budget for the state, as Illinois has been without an official budget since July 2015. In June of last year, the General Assembly ended the year-long stalemate by passing a temporary spending bill. However, that expired on Jan. 1, once again leaving the state without a budget plan. Cullerton and Radogno had originally proposed the bills during a lame-duck session earlier in the month before the new General Assembly was sworn in. Senators balked, however, so the two refiled the bills in the new session and pushed for a vote on Wednesday after Gov. Bruce Rauner gave his “State of the State” address. The vote never came to fruition after senators took issue with various parts of the package. “It’s really progress that might have seemed impossible just a few weeks ago. So, if we need more time to pull us together I’m going to consider that encouraging,” he said. Cullerton said caucus members had “a bunch” of questions about the package, which they said they would try to get answered. Radogno echoed similar sentiments in speaking on the Senate floor, saying the ability to pass a balanced budget was more important than the individual bills in the “grand bargain” package. In what she called a “pep talk,” Radogno urged members to listen to their constituents, but to not cave in to external pressure. “This is hard, and none of us are going to like this in the end, but we have to get the state on a path with a sustainable, balanced budget, and the reforms that are going to keep us there,” she said. Radogno said just because the Senate was “not ready” to take a vote, they were not backing off their effort. The minority leader said she was “heartened” by support they were receiving and knew both caucuses were committed to passing the package. In his annual address Wednesday, Rauner praised the Senate’s work. “Let’s build on that cooperation to achieve a truly balanced budget and changes that really move the needle on job creation and property tax relief,” he said. The governor has not commented publicly on the specifics of the package but has signalled support for the bipartisan effort. It is unclear whether the Democratic leadership in the House is supportive of the measures. Cullerton urged quick action on the package.